BERLIN — Dozens of students from Berlin’s Jewish high school read aloud the names of 55,696 Jews from that city murdered during the Nazi regime as the city readied to commemorate the 80th anniversary of Kristallnacht with more recent anti-Jewish violence in the US and elsewhere prevalent in people’s minds. The reading on Thursday was one of numerous events in the capital and across the country marking the 80th anniversary of the anti-Jewish pogrom of November 9-10, 1938. The commemorations began at 10 a.m. at Germany’s memorial to the murdered Jews of Europe. 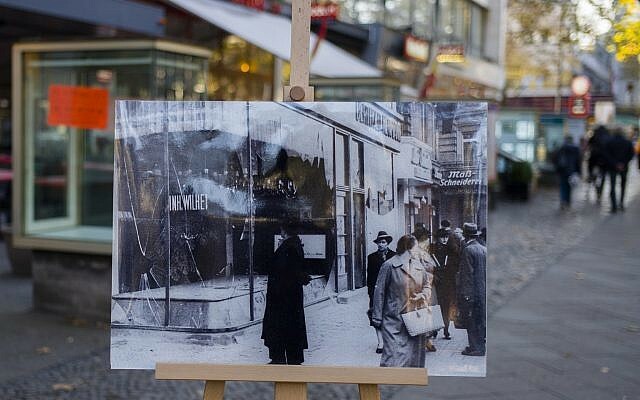 The pogrom — which got its name for the shattered glass from Jewish-owned store windows that covered German streets — is often referred to as the beginning of the Holocaust. Marking the 80th anniversary, Josef Schuster, head of the Central Council of Jews in Germany, will address a central memorial event on Friday alongside German Chancellor Angela Merkel, President Frank-Walter Steinmeier and other dignitaries. 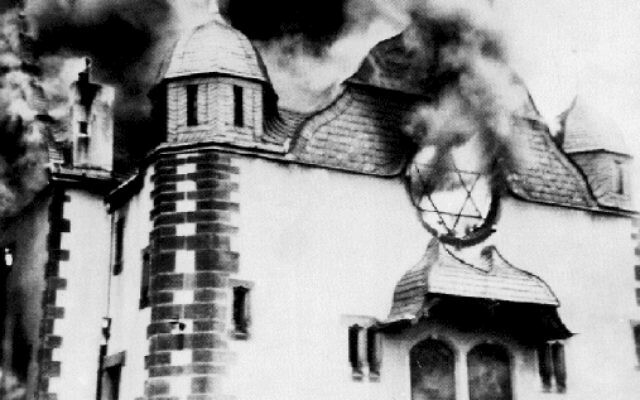 The program will be broadcast live from Berlin’s Rykestrasse Synagogue, which was spared destruction 80 years ago due to its proximity to neighboring buildings. The Leo Baeck Institute will introduce its “1938 Project – Posts from the Past,” which presents personal documents of Jewish eyewitnesses to persecution. Berlin Rabbi Yehuda Teichtal also condemned the synagogue shooting in Pittsburgh last month in which 11 people were gunned down in the deadliest attack on Jews in US history. “It’s a terrible shock … for the Jewish community worldwide. And it shows once again that the ugly head of anti-Semitism can show itself anywhere in the world and we have to actively combat it,” he said. 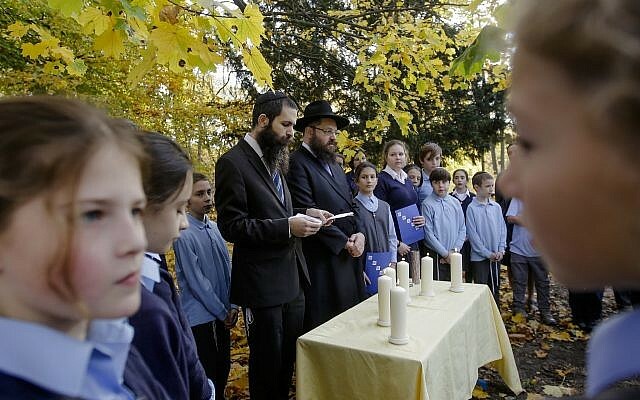 Teichtal was speaking as he led some 30 students from the Jewish Traditional School in Berlin in lighting candles and reciting prayers at their school. He urged them to jointly overcome Germany’s past by building a secure future for Jews in the country. 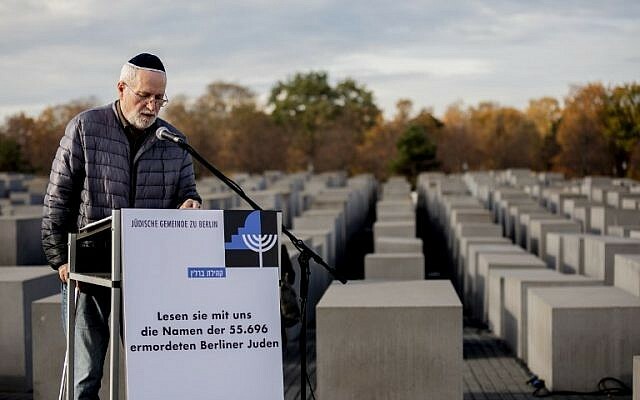 “This is the city where the Holocaust was planned and executed from,” said Teichtal, the head of the Jewish outreach group Chabad in the German capital. “What better answer is there than that, in this very city, the students of the Jewish school from Berlin should jointly pray and light candles showing that the answer to darkness and the evil of the past is to create education for the present and the future,” he said. Students assembled under a maple tree in front of their school building. 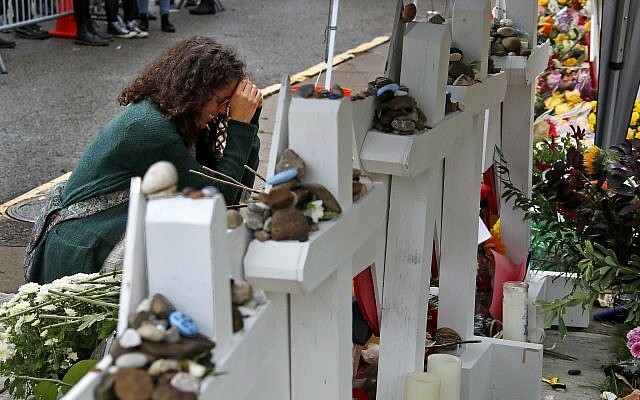 They prayed in Hebrew and German and lit six white candles to commemorate the synagogues that were burned down, as well as the 6 million people who perished in the Holocaust. Berlin’s top security official this week banned a far-right protest planned for Friday, the exact anniversary of Kristallnacht. In explaining his decision, state interior minister Andreas Geisel said such a demonstration would “in a blatant way negate the moral and ethical significance of this memorial day,” the German news agency dpa reported.